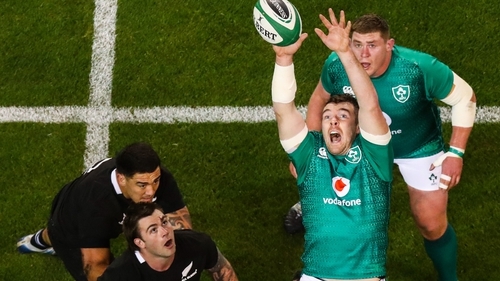 Peter O’Mahony says the atmosphere before, during and after the historic defeat of New Zealand last weekend was the best he ever played in as Ireland build for the 2019 World Cup. The Munster flanker was outstanding against the All Blacks, scooping the man-of-the-match award for his 63 minutes on the pitch. Speaking on the Late Late Show, O’Mahony spoke glowingly of the impact of the boisterous supporters. "I reckon it was probably the best atmosphere I have ever played in," he said. "I remember we were getting on the bus and speaking to Johnny [Sexton] going to the captain’s run. There was probably 50, 60 people waiting for us to get on the bus the day of the game. "Normally there is a tradition that people come to the Shelbourne Hotel as we get on the bus on the game, but this was the biggest crowd I had ever seen the day of the game. "When we got back it was even bigger again. They were after a few beers and were fairly rowdy. It was an incredible occasion, and incredible feeling." Joe Schmidt’s side, ranked second in the world, are being touted as real contenders for next year’s World Cup in Japan, but O’Mahony says the players will be keeping their feet on the ground despite achieving a Grand Slam, a first series win on Australian soil since 1979, as well as last week's victory over the world champions. "It will be, but you hear us saying we will take it game by game," he said when asked if winning the World Cup will be the focus. "We have tomorrow night [against USA] and we’ll reassess and move into the Six Nations. It’s something we are building towards certainly, but we’re not going to get ahead of ourselves." The Cork native was also asked about the influence of Anthony Foley, two years on from the Munster’s coach’s untimely death. "Axel has been a huge part of my career," he said. "He was my first proper coach, the Munster U20s was his first coaching role. I just missed out on playing with him. "We had an incredible relationship and having played a similar position, he had an incredible influence on my career. He had been with me through all the big parts, and the lows as well. "We think about him every day, not just big occasions." RTÉ rugby analyst Donal Lenihan earlier this week described O’Mahony as an "inspirational" leader within the Ireland team who simply leads by example. "It’s just the dog in him," he said when asked what makes the 29-year-old so effective. "You either have that or you don’t. He’s just this inspirational figure. People say, does he talk a lot? "He doesn’t, he just controls by his actions."